The NEF Endowment Fund, begun in June 2002, is a permanent, self-sustaining, multi-million dollar fund that will ensure future excellence and innovation in our city schools. To learn more, view the Endowment Video, Voices for Our Future. The first annual distribution from the Endowment Fund was made in 2007. To learn more about the program and how to submit a preliminary proposal, please see the Distribution Guidelines & Request for Proposals. Our grants programs are made possible through annual donations from the community. Your tax-deductible contributions are invested in programs that provide enhanced skills, enrichment and cultural opportunities for both teachers and students in our schools. Our activities, including community partnerships and the sharing of community resources, foster a spirit of innovation in Northampton schools and support teachers’ initiatives. Since its inception in 1991, the Northampton Education Foundation has invested more than $1,000,000 in contributions back into activities benefiting the Northampton Public Schools. NEF-funded projects incorporate the sciences, language and literacy, diversity, history, technology, and the arts, including artists-in residence, many musical and theatrical performances and workshops, plus after-school art and drama clubs. Through our small grants program, we make semi-annual competitive grants up to $3,000 to teachers, administrators, parents and community members for innovative programs and research that enhance the educational experience for students. Since 1991, we have awarded more than 100 grants to teachers in every public school in the city for programs in virtually every program area offered in our schools. 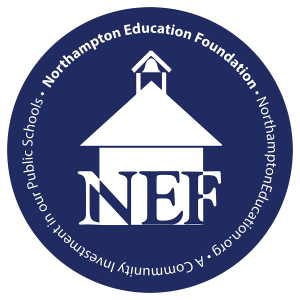 In the spring of 2005, NEF assumed responsibility for the operations formerly run by Support Our Schools (SOS), with the goal of having a single comprehensive organization to support public education in Northampton. Under the merger, NEF has established the SOS Book Fund, which runs exactly as it did under SOS. The fund is designated for textbooks, library books, educational materials, and their electronic/technical equivalents. The Foundation is the recipient of an endowment fund established in memory of Daniel Stephen Goldstein, a 1988 graduate of Northampton High School who had a special love for the arts. Each year, income from this endowment provides for a school-wide outstanding arts event at the high school to expose students to the rich world of the arts. The NEF may award special grants outside of the normal grants cycle, at its discretion, to educators at a time when such grants would allow them to take advantage of opportunities that arise unexpectedly. The maximum grant under this program is $1,000. The Northampton Alumni Database is maintained by the NEF for the purpose of supporting the activities of and communicating with Northampton alumni. Please click here to register. to provide resources for innovation and enrichment in every school. More time. More money. More impact. NEF has launched an important and exciting campaign to ensure the future health of Northampton public schools. Click here to learn more! Please visit Broadside Books between now and March 16, when NEF is their Nonprofit of the Month! Look for an NEF display in the lobby at Forbes Library from March 1 -15. And of course, Wednesday, March 27 is NEF’s annual Adult Spelling Bee! Don’t miss this signature event…. click here! The deadline for application for 2019 Endowment Grants is Sunday March 3, 2019. Click here for the fillable-online application. The deadline for application for Spring 2019 Small Grants to Teachers is Tuesday April 16, 2019.